A panel of experts look at the fall armyworm problem at AGRF. The meeting also featured the launch of an aggressive new consortium to defeat the invasion of the fall armyworm (FAW) now threatening up to US$6 billion of damage to African maize, sorghum, and other critical food crops. In addition, a new multi- billion-dollar irrigation initiative could bring a new level of stability to Africa’s rainfed farming regions. “The majority of Africans still earn their livelihoods…from the land so agriculture deserves the concentrated attention of Africa’s policymakers, scientists, and entrepreneurs,” said HE Paul Kagame, President of Rwanda, the official host country of the Forum. The forum, which attracted some 2800 delegates from around the world, had Lead, Measure, Grow as its theme, highlighting the critical importance of political leadership and rigorous, honest assessments of progress in the agriculture sector for achieving growth that can spread across the entire economy. A crucial goal for AGRF 2018 was to secure greater investments for African farmers and agriculture businesses. And the community rose to the challenge. President of the International Fund for Agricultural Development (IFAD), Gilbert Houngbo, said IFAD anticipates delivering a total of $3.5 billion in new investments over the next few years, half of which will flow to Africa. In addition, officials from the African Enterprise Challenge Fund (AECF) detailed the launch of the $50 million Investing in Women fund that already has secured a $6.42-million commitment from the United Kingdom’s Department for International Development (DFID). Strive Masiyiwa, Founder and Chairman, ECONET Group and Chair of the AGRF Partners Group, said that starting with the 2016 AGRF in Nairobi, commitments to transforming Africa’s poorly performing farmers into poverty fighting powerhouses now top $60 billion. 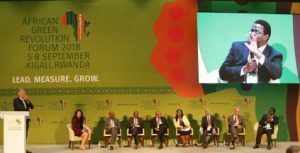 AGRF 2018 highlighted new agriculture partnerships emerging with China, Israel, India, and Brazil. Leaders applauded the launch in January of the first Inaugural Biennial Review, which features an African Agriculture Transformation Scorecard (AATS). Together they provide a detailed, ground- breaking assessment of countries’ progress in achieving agriculture transformation, as well as those areas that still need attention. The report revealed that 20 of 47 African Union Member States are on track to achieve commitments made at the 2014 AU Summit in Malabo, Equatorial Guinea. And they commended the willingness of all 47 countries to provide this thorough and transparent account of progress and ongoing commitment to evidence-based leadership. Other notable achievements at the 2018 AGRF included the launch of the new fall armyworm Research for Development (R4D) International Consortium that brings together 35 public and private sector institutions to create a coordinated strategy and consolidate millions of dollars in new support to fight fall armyworm, and the announcement of the 2018 Africa Food Prize Laureate, which was awarded to IITA, the first institution to receive the prestigious award.